This report provides the most current information and data found, as of May 2007, unless otherwise noted. Wisconsin enjoys a generally clean and abundant groundwater resource.A2 This resource is present because of the state’s geologic history and climate; this resource is protected through strong state and federal regulations, and the cooperative efforts of water systems, trade associations, individual operators, planning commissions, and state and federal science agencies. Drinking water in Wisconsin is provided by either public water systems or private wells. A public water system is defined as a system that provides public water for human consumption, if such a system has at least 15 service connections or regularly serves an average of at least 25 individuals daily at least 60 days out of the year. Wisconsin has nearly 11,500 public water systems which meet the daily water needs of about 4 million people.A1 The Wisconsin Department of Natural Resources (WDNR)A3 oversees these public systems, and additional information can be found online. Public water systems that are owned by a community are called municipal water systems.A4 Shawano County has 10 municipal water systems. In addition to the public water systems, about 850,000 private wells provide drinking water to Wisconsin's population. Unlike public water systems, protection and maintenance of a private well is largely the responsibility of homeowners. Information on how to build and protect your private water supply can be found on the WDNR web site.A5 The USGS is finalizing the "Summary of Water Use in Wisconsin for 2005." When released, this summary will show the percentage of the Shawano County population whose drinking water comes from private wells versus municipal systems. For recommendations of groundwater protection policies and some outstanding examples of innovative groundwater protection policies adopted by other communities see Groundwater Protection Policies. Of those municipal water systems that have wellhead protection (WHP) plans, some have a WHP plan for all of their wells, while others only have a plan for one or some of their wells. Similarly, of those municipal water systems that have WHP ordinances, some ordinances apply to all of their wells and others just one or some of their wells. Unlimited livestock access to waters of the state where high concentrations of animals prevent adequate sod cover maintenance. More information is available from the WDATCP. Your county may have additional policies in place for groundwater protection. A good way to find out is to check with the county conservationist and local zoning administrators. 1 municipal water system in Shawano County has spent money to reduce nitrate levels. As of 2005, over 20 municipal water systems in Wisconsin have spent over $24 million reducing nitrate concentrations in municipal water systems.C3 Spending to reduce nitrate levels in municipal wells in Shawano County is shown in the table below. The increase in total water use over this period is due to a increase in industrial use. As part of the National Water-Use Information Program, the USGS stores water-use data in standardized format for different categories of water use. In 1978, the USGS entered into a cooperative program with the WDNR to inventory water use in Wisconsin. Since that time, five reports summarizing water use have been published (Lawrence and Ellefson, 1982D2; Ellefson and others, 1987D3; Ellefson and others, 1993D4; Ellefson and others, 1997D5; Ellefson and others, 2002D6; Buchwald and others, 2008D7). Water use in Wisconsin in these summary reports is reported in the following categories: domestic, livestock, aquaculture, industrial, commercial, public use and losses, thermoelectric or mining. References describing the methods for collecting data and estimating water use are provided in the summary reports. In Wisconsin, 70% of residents and 97% of communities rely on groundwater as their drinking water source. Wisconsin has abundant quantities of high-quality groundwater, but once groundwater is contaminated, it's expensive and often not technically possible to clean. Because of these factors, we need to be careful to protect our groundwater from contamination. Our activities on the land can contaminate groundwater - most contaminants originate on the land surface and filter down to the groundwater. In some cases however, groundwater can become contaminated from natural causes such as radioactivity due to the presence of radium in certain types of rocks. “Susceptibility of Groundwater to Pollutants” is defined here as the ease with which a contaminant can be transported from the land surface to the top of the groundwater called the “water table”. Many materials that overlie the groundwater offer good protection from contaminants that might be transported by infiltrating waters. The amount of protection offered by the overlying material varies, however, depending on the materials. Thus, in some areas, the overlying soil and bedrock materials allow contaminants to reach the groundwater more easily than in other areas of the state. In order to identify areas sensitive to contamination, the Wisconsin Department of Natural Resources, in cooperation with the University of Wisconsin-Extension, Wisconsin Geological and Natural History Survey and the USGS, has evaluated the physical resource characteristics that influence this sensitivity. Five physical resource characteristics were identified as important in determining how easily a contaminant can be carried through overlying materials to the groundwater. These characteristics are depth to bedrock, type of bedrock, soil characteristics, depth to water table and characteristics of surficial deposits. Existing statewide maps of these five characteristics were used whenever possible. New maps were compiled when existing information wasn’t already mapped. The resource characteristic maps used in this project were compiled from generalized maps at a scale of 1:250,000 or 1:500,000. Each of the five resource characteristic maps was put into digital form using a Geographic Information Systems (GIS) program. All of the information contained in the five maps were overlaid and combined into one composite map. A numeric rating scheme developed for each map was used to score the maps and the five resource map scores were added together within GIS. The composite map shows the scores for each area – low scores represent areas that are more susceptible to contamination and high scores represent areas that are less susceptible to contamination. The method described above is a subjective rating method; specifically an index method. An index method assigns a subjective ratings or score to physical resource characteristics of an area to develop a range of contamination susceptibility categories (ranging, in this case, from more susceptible to less susceptible). Index methods are fairly popular approaches to groundwater susceptibility, because they are quick and straightforward, and they use data that are readily available. However, the mapped distribution of susceptibility categories produced by an index method is typically fraught with uncertainty, primarily due to the subjectivity in the approach. The susceptibility categories include little quantifiable or statistical information on uncertainty and this limits their use for defensible decision making. So while susceptibility maps produced using index methods can be useful, their inherent uncertainty must be kept in mind. (National Research Council, 1993E1; Focazio and others, 2002E2). 92% of 211 private well samples collected in Shawano County from 1990-2006 met the health-based drinking water limit for nitrate-nitrogen. Human health is the primary reason high levels of nitrate in drinking water are of concern.F3 Nitrate can cause a condition called methemoglobinemia, or “blue-baby syndrome,” in infants under six months of age. Nitrate in water used to make baby formula converts to nitrite in the child’s stomach and changes the hemoglobin in blood to methemoglobin. The infant’s body is then deprived of oxygen. In extreme cases, methemoglobinemia can be fatal; the long-term effects of lower-level oxygen deprivation are unknown. The conversion of nitrate to nitrite in the human body also creates N-nitroso compounds, which are some of the strongest carcinogens known. As a result, additional human health concerns linked to nitrate-contaminated drinking water include increased risk of non-Hodgkin’s lymphomaF8, gastric cancerF9, E10, and bladder and ovarian cancer in older women.F11 There is also growing evidence of a correlation between nitrate and diabetes in children.F12, E13 The current drinking water limit of 10 mg/L for nitrate-nitrogen addresses only methemoglobinemia; the concentration at which cancer risks occur is unknown. Nitrate also affects surface water ecosystems by increasing the growth of nuisance algae that then die and deplete the water of oxygen. Between the late 1960s and the early 1980s, nitrate levels in waters flowing into the Gulf of Mexico more than doubled, causing a “dead zone” that in 1999 was approximately the size of the state of New Jersey.F14 In Wisconsin, the effects of increasing nitrate levels in surface waters are mostly unstudied. Because of the health concerns, public water supplies that exceed the 10 mg/L limit are required to reduce the nitrate-nitrogen level. The most common solutions include drilling a new, usually deeper, well; blending contaminated water with non-contaminated water to lower the nitrate concentration; or removing nitrate through water treatment processes. However, such solutions are often costly. By 2006, 25 Wisconsin public drinking water systems had exceeded the nitrate limit and collectively spent over $24 million on remedies. This number is up sharply from just 14 in 1999.F3 For information about which public drinking water systems exceeded the nitrate limit see Money Spent on Cleanup. Some local governments have been successful with providing incentives to farmers to grow groundwater-friendly crops or otherwise limit nitrogen applications around city wells. For example, the city of Waupaca identified fields in the recharge area for its wells and provided various incentives for farmers to enter into cropping agreements to limit nitrate inputs.F22 A community may choose to hire a specialist to evaluate nitrate-susceptible areas and develop possible management strategies. NR243 (finalized and to be promulgated in spring 2007) lowers nitrogen levels reaching groundwater from manure and process wastewater by requiring improved manure storage facilities and prohibiting excessive or improper application of manure and process wastewater on cropped fields. This rule will apply to large Concentrated Animal Feeding Operations of 1000 animal units and larger. Currently, there are about 150 of these permitted operations in Wisconsin. ATCP51 (enacted in April 2006) is a livestock siting standard that protects areas susceptible to groundwater pollution. Required standards prevent runoff from entering sinkholes, ensure that existing storage structures do not leak, and require a manure application plan that minimizes risks to groundwater, including existing wells. This adopted rule is expected to apply to about 70 new and expanding farms of more than 500 animal units each year. ATCP50 (still pending as of April 2007) applies to all farms and includes the requirement for nutrient management plans by 2008. It incorporates new 2005 USDA NRCS nutrient standards (590 standards) for both nitrogen and phosphorus application. Some nitrate loss from agricultural activities seems inevitable even with good management practices, especially in areas with coarse-textured soils or shallow soils over fractured bedrock. From a planning perspective, therefore, the solutions may lie in keeping new agricultural operations out of the zone of influence for existing wells, and in avoiding the location of new private or public wells in areas where nitrate contamination in groundwater has already occurred. Education Tool: Education and citizen participation in making land use decisions, implementing land use goals, and taking private actions aimed at limiting nitrate contamination of groundwater. Environmental Assessment Tool: Environmental assessment requirements within zoning or subdivision ordinances to provide detailed information about the potential effects of proposed development on nitrate levels in groundwater, or to ensure that suitable sources of water for private wells are available on a proposed development site. Facility Planning Tool: More detailed facility plans for potential contamination sources, such as spill containment plans for potential nitrate sources. Performance zoning, which outlines general water quality goals that developers or other landowners can meet by a variety of methods. Overlay zoning, which allows special regulations of sensitive environmental areas such as wellhead protection districts or groundwater recharge areas. Planned Unit Developments may allow developers to vary some of the standards in local zoning ordinances to allow innovative approaches that may better protect groundwater. Subdivision regulations could include requirements for adequate and safe water supply and wastewater disposal and treatment facilities, as well as addressing land suitability and environmental and design issues. (For further information on subdivisions’ impacts on groundwater, see footnote #3). Density transfers can allow the transfer of development rights from one parcel that a community wants to protect to another parcel where the community wants development to occur. Outright purchase of land needed for groundwater protection by communities or non-profit conservation organizations. Conservation easements could limit land uses to those not likely to contaminate groundwater with excess nitrate. Purchase of development rights can protect land from development with certain types of groundwater-contaminating activities while allowing the landowner to retain ownership of the land and the ability to sell or transfer it at any time. Eminent domain allows government to take private property for public purposes with compensation to the owner, even without the owner’s consent. This tool could be used to acquire critical groundwater protection areas. Capital improvement programs that help a community plan and budget for capital improvements such as water supplies and wastewater treatment facilities. Impact fees can require new developments to pay for improvements needed to serve that development. WDNR may provide grant or loan programs to help communities assess and meet their needs in areas involving sensitive natural resources such as groundwater. A community could also consider hiring a specialist to evaluate areas where groundwater is particularly vulnerable and to identify agricultural and other strategies to minimize nitrate leaching. A pesticide is any substance used to kill, control or repel pests or to prevent the damage that pests may cause.F26 Included in the broad term “pesticide” are herbicides to control weeds, insecticides to control insects, and fungicides to control fungi and molds. Pesticides are used by businesses and homeowners as well as by farmers, but figures for the amounts and specific types of pesticides used are not generally available on a county-by-county basis. A 2005 report indicates that approximately 13 million pounds of pesticides are applied to major agricultural crops in Wisconsin each year, including over 8.5 million pounds of herbicides, 315,000 pounds of insecticides, one million pounds of fungicides, and 3 million pounds of other chemicals (this last category applied mainly to potatoes).F27 The report also shows that herbicides are used on 100% of carrots for processing, 99% of potatoes, 98% of cucumbers for processing, 98% of soybeans, 97% of field corn, 89% of snap beans for processing, 87% of sweet corn, and 84% of green peas for processing. Insecticides are used on 97% of potatoes, 96% of carrots, and 88% of apples. Fungicides are used on 99% of potatoes, 88% of carrots, and 89% of apples. and average pesticide application per crop in Wisconsin. major crops in Wisconsin, 2004-2005. As of 2006, the WDATCP has prohibited the use of the popular corn herbicide atrazine on 102 designated atrazine prohibition areas in Wisconsin, covering about 1.2 million acres.F25 There are no atrazine prohibition areas in Shawano County. Once a pesticide is applied, it ideally will harm only the target pest and then break down through natural processes into harmless substances. However, the actual fate of pesticides in the environment may include evaporation into the air; runoff into surface water; plant uptake; breakdown by sunlight, soil microorganisms or chemical reactions; attachment to soil particles; leaching into groundwater; or remaining on the plant surface and removal at harvest. The WDATCP conducted a private well water study from 2000-2001, looking for some of the most commonly used herbicides in Wisconsin.F29 From that study, the statewide estimate of the proportion of private drinking water wells that contained a detectable level of a herbicide or herbicide metabolite (breakdown product) was 37.7%. The map at the right shows the estimated percentage of wells containing herbicide or herbicide metabolites by region. The study did not look at less commonly used herbicides or any insecticides or fungicides. WDATCP is doing a similar study in 2007 that includes analysis for a greater number of pesticides. Determining which pesticides are in groundwater at a given location and time is difficult and can be expensive. A pesticide test generally looks for a single chemical, or more commonly, a broad group of chemicals, but not all pesticides are detected by any one test. Pesticides break down over time into metabolites which may not have the same testing method as the parent compound. Further, some pesticides do not have approved testing methods, so they cannot be measured in water. The health effects of pesticide exposure vary by pesticide. For example, atrazine, a common corn herbicide, has been linked to weight loss, cardiovascular damage, retinal and some muscle degeneration, and cancer when consumed at levels over the drinking water limit for long periods of time.F31 Long-term exposure to alachlor, another herbicide, is associated with damage to the liver, kidney, spleen, and the lining of the nose and eyelids, and cancer.F32 Only about 30 pesticides currently have health-based drinking water limits in Wisconsin, so occasionally, pesticides are detected in drinking water, but their harmful levels or health effects are unknown. Also unknown are the health effects of a combination of pesticides in drinking water, even at levels below the drinking water limit for any one of the pesticides. National Pesticide Information Center: includes how pesticides work, toxicity, metabolites, and environmental effects. Determine what pesticides are being used and where. Test wells in these areas for these pesticides and their metabolites. For pesticides with established drinking water limits, keep concentrations below the drinking water limit. Encourage and support the use of organic farming methods in the county. Limit use of lawn pesticides (perhaps by limiting lawn size). Because of differences in pesticides, soils, and management practices, knowing which crops are grown in an area alone does not accurately indicate the risk to human health. However, knowing where pesticide use is likely to be heaviest may be useful in comprehensive planning if one of the goals is to minimize human exposure to potential contaminants in the environment. Education Tool: Education and citizen participation in making land use decisions, implementing land use goals, and taking private actions aimed at limiting pesticide contamination of groundwater. The University of Wisconsin – Madison and UW - Extension have many educational programs in place to help farmers limit the use of pesticides and pesticide losses to the environment,F33 such as the Integrated Crop and Pest Management (ICPM) program, which can be accessed and implemented locally through the county Extension office. Environmental Assessment Tool: Environmental assessment requirements within zoning or subdivision ordinances to ensure that suitable sources of water for private wells are available on a proposed development site. Facility Planning Tool: More detailed facility plans for potential contamination sources, such as spill containment plans for potential pesticide sources. Conservation easements could limit land uses to those not likely to contaminate groundwater with pesticides. A community could identify agricultural lands in the recharge area for its wells and provide various incentives for farmers to enter into cropping agreements to limit pesticide inputs. A community may hire a specialist to evaluate areas of high pesticide use and develop possible pesticide management strategies or promote low-pesticide agricultural systems or organic farming systems which forbid the use of synthetic pesticides. A community may encourage food processors that purchase organic or groundwater friendly foods to locate or form in the area. Most private wells in the county have unknown arsenic levels. Drinking water with elevated levels of arsenic may lead to a variety of health effects, including:F36 skin cancer, internal cancers (bladder, prostate, lung, and other sites), thick, rough skin on hands and feet, unusual skin pigmentation (dappling of dark brown or white splotches), numbness in the hands and feet, circulatory disorders, tremors, stomach pain, nausea, diarrhea, diabetes, depression. Well construction techniques that introduce oxygen into the aquifer. However, revised WDNR drilling rules and special well casing requirements have greatly reduced well construction problems.F44 Maps are available from the WDNR that show special well construction and well casing requirements by section for towns in Winnebago and Outagamie Counties. In southeastern Wisconsin and the glacial moraines of northern Wisconsin, the mechanism by which arsenic is released from geologic materials is different. The arsenic is associated with iron oxides and is released by natural reduction reactions that cannot readily be prevented or controlled.F3, E38, E39 In such areas, alternatives are limited to treating water or using another (often shallower) aquifer, if one is present and not contaminated with nitrate or other human-induced contaminants. Maps and other resources can be consulted to determine the likelihood of arsenic contamination of drinking water supplies in areas designated for residential development, and possible need for alternate water supplies in those areas. Generalized maps can be found on the WDNR web site for both public and private water supplies sampled until 2000. Madeline Gotkowitz (mbgotkow@wisc.edu, 608/262-1580) at the Wisconsin Geological and Natural History Survey has done extensive research and public outreach on arsenic problems in Wisconsin’s groundwater. Testing and education programs can be conducted for owners of existing private wells in arsenic-prone areas to check current arsenic levels in private wells, to advise about treatment options, and to inform about ways to limit further arsenic release in the aquifer, where applicable. Restricting residential growth, encouraging or mandating water conservation, or finding alternate water sources may be beneficial in areas where oxidation is the primary method of arsenic release. For further information on arsenic, please visit the WDNR Arsenic in Drinking Water and Groundwater web site. Information on volatile organic compounds, pharmaceuticals and personal care products, and chloride. The list of pharmaceuticals is long and includes such medications as tranquilizers, pain killers, antibiotics, birth control, hormone replacement, lipid regulators, beta blockers, anti-inflammatories, chemotherapy, antidiabetics, seizure control, veterinary drugs, antidepressants, and other psychiatric drugs. There is a related category of chemicals referred to as "personal care products" that includes cosmetics, perfumes, soaps, sunscreens, insect repellants, and so forth. The volume of pharmaceuticals and personal care products entering the environment each year is about equal to the amount of pesticides used. Since groundwater gets into the ground at the land surface, it makes sense that what happens on the land surface can have impact on groundwater. 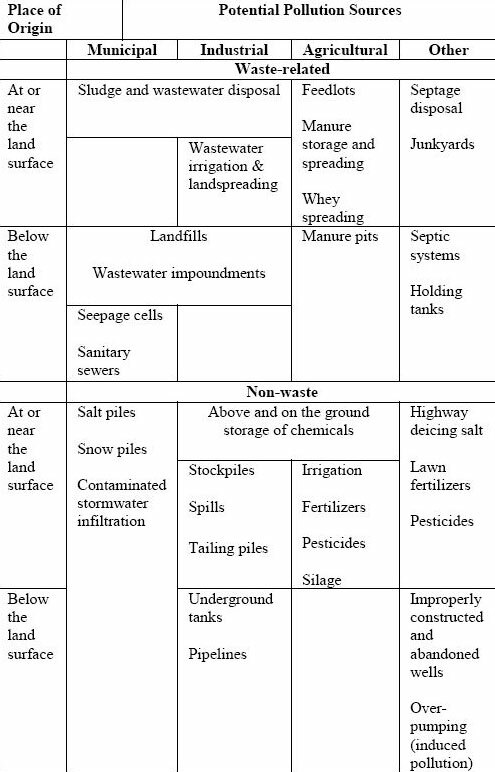 A great many land use activities have the potential to impact the natural quality of groundwater, as shown in the table below. A landfill may leach contaminants into the ground that end up contaminating groundwater. Gasoline may leak from an underground storage tank into groundwater. Fertilizers and pesticides can seep into the ground from application on farm fields, golf courses or lawns. Intentional dumping or accidental spills of paint, used motor oil, or other chemicals on the ground can result in contaminated groundwater. The list could go on and on.G1 The rest of this section provides county-specific information about potential sources of groundwater contaminants. Properties that were or are contaminated with hazardous substances can be found using the WDNR's Bureau for Remediation and Redevelopment Tracking System (BRRTS). The figure on the right shows the BRRTS map of contaminated sites in Shawano County. Royal blue diamonds on the map indicate open leaking underground storage tank (LUST) sites which have contaminated soil and/or groundwater with petroleum, which includes toxic and cancer-causing substances. However, given time, petroleum contamination naturally breaks down in the environment. Turquoise diamonds on the map indicate open environmental repair (ERP) sites which are sites other than LUSTs that have contaminated soil and/or groundwater. Examples include industrial spills or dumping, buried containers of hazardous substances, and closed landfills that have caused contamination. More information for the sites on the figure is available online. The WDNR Bureau of Remediation and Redevelopment Tracking System (BRRTS) contains information about locations at which there have been releases of hazardous or potentially hazardous substances to the lands, waters, or air of the State of Wisconsin. Degradation of groundwater quality is one of the primary concerns at BRRTS sites, but soil, vapor, air, and surface water contamination are also areas of concern. Abandoned Container (AC) – an abandoned container with potentially hazardous contents has been inspected and recovered, but discharge to the environment has not occurred. Leaking Underground Storage Tank (LUST) – a leaking underground storage tank has contaminated soil and/or groundwater with petroleum. Petroleum products contain cancer-causing and toxic substances, but may biodegrade, or break down naturally in the environment, over time. Environmental Repair (ERP) – sites other than LUSTs that have contaminated soil and/or groundwater. Industrial spills or dumping, buried containers of hazardous substances, closed landfills, and leaking above-ground petroleum storage tanks are potential ERPs. Voluntary Party Liability Exemption - an elective process in which a property owner conducts an environmental investigation and cleanup of an entire property and then receives limits on future liability for that contamination. Spills – discharges of hazardous substances, usually cleaned up quickly. For further information, see the BRRTS web site glossary. Inventory contaminated sites and identify their status. The summary document prepared for each county on this web site lists BRRTS sites that are still open. Other sites of interest may include closed sites and conditionally closed sites on the BRRTS list, or sites in the community that have not yet been investigated by WDNR but are suspected to have had hazardous releases in the past. Details about such restrictions are available in the GIS Registry of Closed Remediation Sites fact sheet. A list of WDNR staff contacts to assist with various aspects of remediation and redevelopment of contaminated sites, including assistance grants for local governments, is available online. For more information, please see Environmental Contamination – The Basics, WDNR publication PUB-RR-674 July, 2004. By definition, CAFOs have greater than 1000 animal units. CAFOs are required under their Wisconsin Pollutant Discharge Elimination System (WPDES) permits to practice proper manure management and ensure that adverse impacts to water quality do not occur. Permit applicants must submit detailed information about the operation, a manure management plan, plans and specifications for all manure storage facilities, and a completed environmental analysis questionnaire. Once a WPDES CAFO permit is issued, operators must comply with the terms of the permit by following approved construction specifications and manure spreading plans, conducting a monitoring and inspection program, and providing annual reports. Other potential groundwater contaminants from agriculture include fertilizers and pesticides. Large amounts of nitrogen fertilizers are used when fields are planted continuously with corn, and they can leach into groundwater as nitrate. For more information, please visit the WDNR CAFO web site. The county may have additional facilities listed in the Registry of Waste Disposal Sites, available from the WDNR, that includes active, inactive, and abandoned sites where solid or hazardous wastes were known, or were likely, to have been disposed. The inclusion of a site on the Registry does not mean that environmental contamination has occurred, is occurring, or will occur in the future. The Registry is intended to serve as a general informational source for the public, and State and local officials, as to the location of waste disposal sites in Wisconsin. Wisconsin's solid waste management program has been in place for over 30 years. In the first two decades of the program, efforts were primarily directed toward: licensing existing solid waste facilities; closing poorly located or operated facilities; and ensuring that new solid waste facilities were properly located, designed, constructed, operated, closed, and maintained. During this period, the vast majority of municipal and industrial solid waste generated was landfilled. In the 1990s, things began to change. Wisconsin's Recycling Law was passed in 1990, with most of the requirements taking effect in 1995. In 1997, ch. NR 538, Wis. Adm. Code was promulgated, facilitating the beneficial use of industrial byproducts. These two milestones resulted in significant and still-increasing quantities of waste being diverted from landfills. The solid waste program strives to ensure proper management of solid waste and works with its customers to increase waste reduction, reuse, and recycling. For more information on solid waste management in Wisconsin, see the Future of Waste Management Study completed in 2001. A complete list of licensed landfills in Wisconsin for 2007 can be found online. More information on solid waste is available from the WDNR. In 1980, Congress passed the Comprehensive Environmental Response, Compensation, and Liability Act (CERCLA), commonly known as the Superfund law. The Superfund law created a tax on the chemical and petroleum industries. The tax went into a trust fund to help pay for cleaning up abandoned or uncontrolled waste sites. The U.S. Environmental Protection Agency (EPA) administers the Superfund trust fund and works closely with state and local governments and tribal groups to remediate sites that may endanger public health or the environment. The contamination at many of these sites was created years ago when environmental regulations were virtually nonexistent and companies dumped or emitted hazardous materials freely into the environment. Years later the threat to humans and the ecosystems remains so great that the sites need to be cleaned up. Unfortunately, since much of this contamination was caused so many years ago, it can be hard to find the parties responsible, or the parties responsible may be unwilling or unable to pay for the cleanup. In these cases, the Superfund trust fund can be used to pay for most of the cleanup process. States must pay for a portion of such cleanups. Now that you’ve inventoried groundwater data and analyzed it, what’s next? How do you use this information to lead to on-the-ground actions? Now comes the key part of the planning process, where it’s important to involve as many community members as possible to develop and implement a plan of action to protect groundwater. The following sections of this web site are intended to help your community move forward together to protect groundwater. For more information about this site, its contributors, and the data contained herein, click here. For assistance concerning comprehensive planning, please contact Lynn Markham, UW-Stevens Point. For assistance concerning groundwater, please contact Charles Dunning, USGS.